Lead nurturing is the process of building strong relationships with qualified prospects regardless of when they will be ready to purchase. It is a strategy of supplying free, useful information with the goal being to earn their business and their trust for whenever they are ready to buy. It is an opportunity to get to know the lead first, understand their needs, and then make a real connection. 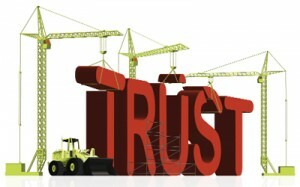 It’s important to understand how lead nurturing can build trust with potential prospects. The real purpose of lead nurturing is to establish a mutually beneficial relationship, where the lead will eventual rely on the information provided and in return grant the company their business when the need arises. It should not be used to coerce a prospect to buy through obvious sales gimmicks or calls to action. Effective lead nurturing starts with branding the business as an expert in their field. The fastest way to build a solid reputation is by providing quality content at no charge with no obligation to make a purchase. Trust is created if content is relevant, useful and directly related to a lead’s specific needs. The more a company can personalize the content to the reader the easier it will be to build a trusting relationship. Communication should have the appearance of a one-on-one conversation rather than a mass emailing from a company eager to promote their services. It should come across as a sincere offering of advice or guidance that provides a real solution to a leads specific concern. Lead nurturing information should also qualify the need for purchase through clever content that guides the lead to a pre-determined conclusion. The content should suggest that a purchase is beneficial without actually requesting their business. Focus on how the lead will have an improved experience or how they will save money or make money by utilizing the product or service. Lead nurturing requires a delicate balance of understanding each lead and nurturing them in the right direction without overpowering or offending them. It is not a race to the finish line approach; rather, each lead will convert on their time schedule. The end result should be a sense of trust and loyalty that benefits both parties for years to follow. Once a prospect truly trusts in a company through effective lead nurturing, they will be customer for life…or at least as long as the trust is still there.